China, with its huge manufacturing sector, is the world’s largest consumer of all kinds of base metals, as well as the largest producer of metal products. The country also ranks as the biggest producer of iron, aluminium, lead and zinc in the world. China’s economic development has a great impact on the global prices of base metals, which are strongly correlated with those of downstream metal products such as metal sheets, bars, tubes, wires and other products. In recent years, China’s metal processing sector has been facing a number of challenges, in the context of the country's shift from an investment-driven to a consumption-driven economy. The metal processing sector is characterised by low levels of concentration, fierce competition, severe steel overcapacity and a relatively low level of technological innovation. 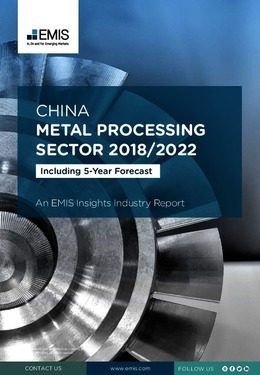 This report provides a complete and detailed analysis of the metal processing sector for China. EMIS Insights presents in-depth business intelligence in a standard format across countries and regions, providing a balanced mix between analysis and data.